After Mons­ter Hun­ter beca­me a mas­si­ve hit on the PSP, the­re were many attempts to repli­ca­te its suc­cess. 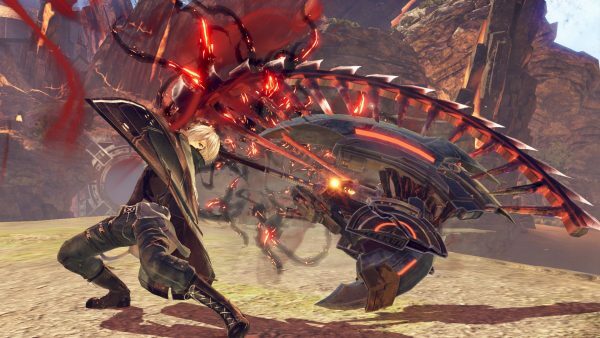 God Eater mana­ged to set its­elf apart from the crowd thanks to its uni­que ene­my designs and mecha­nics, but it has never mana­ged to gar­ner the same atten­ti­on as the series it was inspi­red by. While I don’t think this will chan­ge with the release of God Eater 3, this latest ent­ry is still worth try­ing. The events of God Eater 3 take place a few years after the events of God Eater 2: Rage Burst. The world is still under thre­at from Ara­ga­mi, beings that exist only to con­su­me and can chan­ge form based on what they eat. Due to an unex­p­lai­ned event that takes place befo­re God Eater 3, the batt­le against the Ara­ga­mi has taken a turn for the wor­se, and what used to be Euro­pe has chan­ge into the inhos­pi­ta­ble Ash­lands. The only ones who can effec­tively fight in the Ash­lands are Adap­ti­ve God Eaters, who are resistant to the effec­ts ash has on regu­lar humans. As with the last two games, you crea­te the main cha­rac­ter using a some­what limi­ted amount of cus­to­mi­sa­ti­on opti­ons. The­re are only a few dif­fe­rent faces to choo­se from, along a few access­ories and cos­tu­mes to try and make your cha­rac­ter look uni­que. It’s a shame that the­re weren’t more ways to design your cha­rac­ter, espe­ci­al­ly in a game like this whe­re they’ll be appearing in most of the cuts­ce­nes. They also have litt­le real impact on the sto­ry its­elf, usual­ly just stan­ding around while the other cha­rac­ters have their own con­ver­sa­ti­ons. As for the sto­ry its­elf, it has some inte­res­ting moments, but most events are over befo­re they’ve real­ly began. Com­ing from God Eater 2 the fas­ter pace is some­what appre­cia­ted, it’s just that ins­tead of being over­ly drawn out, the sto­ry pas­ses by too quick­ly. The over­all cast of cha­rac­ters was made smal­ler, but many of them are still given litt­le time to deve­lop. Hugo, the main cha­rac­ters child­hood fri­end, is one of the few cha­rac­ters that is hand­led well, but the rest of your allies end up being igno­red for most of the sto­ry. 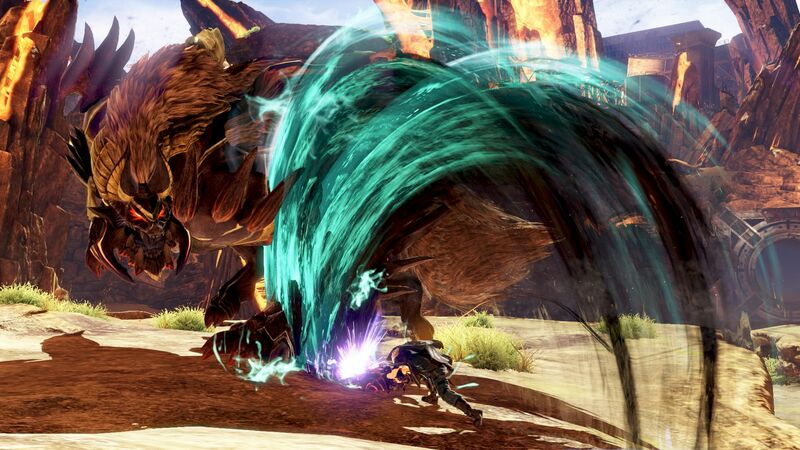 God Eater 2 fea­tured cha­rac­ter epi­so­des, small sets of events that hel­ped to add more per­so­na­li­ty to even some of the minor cha­rac­ters in the game. The­se would have been wel­co­me here, as they’d not only make the cast more inte­res­ting but also give the play­er more to do than just the main sto­ry. Ano­t­her noti­ce­ab­le issue with the sto­ry comes from the Eng­lish voice acting. It doesn’t have the hor­ren­dous­ly low audio qua­li­ty like in God Eater 2, but it still doesn’t sound qui­te as good as the Japa­ne­se audio. Many lines are also deli­ve­r­ed poor­ly, eit­her put­ting empha­sis on the wrong words or not con­vey­ing the right emo­ti­ons. It’s far from the worst dub we’ve heard but it could have been so much bet­ter. 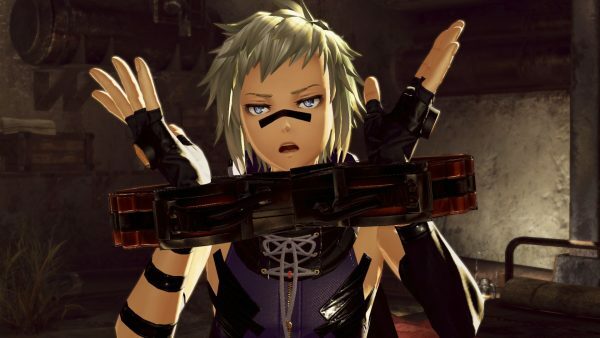 When it comes to batt­ling Ara­ga­mi, not much has chan­ged from the most recent release of the first game God Eater: Resur­rec­tion. Basic attacks are still quick, even with hea­vier wea­pons like the ham­mer, and you can dash to avo­id attacks. The new­ly added dive move also allows for quick move­ment around the map, some­thing that you’ll rely on often to cha­se fle­eing Ara­ga­mi or just collect mate­ri­als quick­ly. The burst mecha­nic is also here, being one of the more uni­que parts of the God Eater series. Every God Arc, the wea­pons that God Eaters use to fight Ara­ga­mi, has the abi­li­ty to devour enemies to power up its user. Devou­ring lets you enter burst, which streng­t­hens your offence and defence along with gran­ting access to a hel­pful dou­ble jump. Burst can be sta­cked up to level 3, though get­ting past level 1 requi­res allies to use link burst, some­thing that is also gai­ned by devou­ring. Burst manage­ment is a big part of suc­cess­ful­ly com­ple­ting mis­si­ons quick­ly, though your AI part­ners can be hit or miss when it comes to using link burst. This isn’t the only mecha­nic that is used to try and encou­ra­ge coope­ra­ti­on. The new­ly intro­du­ced enga­ge requi­res you to stay clo­se to allies during batt­le so that you can active dif­fe­rent stat boosts. When enga­ge is activa­ted, two allies gain both posi­ti­ve effec­ts that they each set befo­re the mis­si­on. The­se effec­ts are usual­ly not too power­ful, but can help to take down Ara­ga­mi fas­ter. Ano­t­her new fea­ture, acce­le­ra­te, also offers small tem­pora­ry effec­ts if you ful­fil cer­tain con­di­ti­ons. Acce­le­ra­te feels even less impac­t­ful than enga­ge, and it would have made sen­se to just use a more power­ful ver­si­on of one of the­se mecha­nics ins­tead. For examp­le, God Eater 2: Rage Burst had a simi­lar fea­ture to acce­le­ra­te that offe­red far grea­ter bene­fits but also requi­red more work to activa­te. This not only gave a more noti­ce­ab­le power up to your cha­rac­ter, but also made batt­les far more inte­res­ting. At the very least, the new wea­pons that were added into the game are uni­que and can be a lot of fun to use. The hea­vy moon is the wea­pon we used for the majo­ri­ty of mis­si­on, and it’s a stran­ge mix of cha­kram and axe. Even being the second slo­west wea­pon in the game, it’s still quick com­pa­red to hea­vy wea­pons in games like Mons­ter Hun­ter and Tou­ki­den. Each wea­pon also has access to burst arts that can modi­fy ground, air and dash attacks. The­se can only be used during burst, making devou­ring even more important. Burst arts can drasti­cal­ly chan­ge the feel of a wea­pon and are a wel­co­me addi­ti­on . Com­bat is enjoy­a­ble over­all, even with some bland mecha­nics here and the­re, and the high speed of batt­les is a breath of fresh air com­pa­red to other hun­ting games. 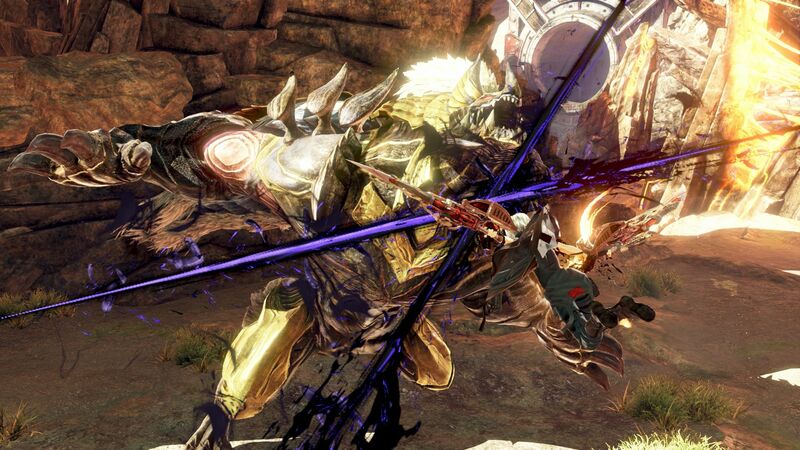 The main issue howe­ver is that God Eater 3 is just too easy. Ara­ga­mi go down incredi­b­ly quick­ly – only a coup­le of mis­si­ons took us lon­ger than 10 minu­tes – and as you go through the ranks they never gain any new attacks. When the sto­ry is hyp­ing up an ene­my as incredi­b­ly power­ful and you end up kil­ling it in less than 5 minu­tes, it ends up being some­what disap­poin­ting. The har­dest mis­si­ons are the ones whe­re you’re figh­t­ing mul­ti­ple Ara­ga­mi at once, and even then you can just use your AI part­ners to split them up. The­re also aren’t that many mis­si­ons even if you inclu­de optio­nal ones, each dif­fi­cul­ty rank befo­re the post game have only a hand­ful of extra mis­si­ons to do. One area that has defi­ni­te­ly been impro­ved over the pre­vious games is God Eater 3’s pre­sen­ta­ti­on. Being the first game not desi­gned for hand­helds, the visu­als are far nicer and it’s gre­at to see what the older Ara­ga­mi look like when not held back by sys­tem limi­ta­ti­ons. Brea­king Ara­ga­mi parts is espe­ci­al­ly satis­fy­ing thanks to the new break ani­ma­ti­on and sound effect. One unfor­tu­n­a­te gra­phi­cal issue that was pre­sent in the pre­vious God Eater games, AOE mar­kers not working pro­per­ly when on slo­pes, is still not fixed even with the visu­al impro­ve­ments. They still clip into the ground and can make avoi­ding cer­tain attacks dif­fi­cult. God Eater 3 is a good attempt at impro­ving an alrea­dy decent series, but a few key pro­blems stop it from being a true clas­sic. The various chan­ges and refi­ne­ments made to the typi­cal God Eater game­play are wel­co­me for the most part, and as long as you can deal with a lack of con­tent and chal­len­ge the­re is defi­ni­te­ly fun to be had.